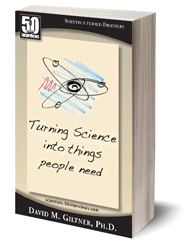 My friend Rich Youngworth pointed me toward an inspiring book entitled Turning Science into Things People Need. Through interviews with ten prominent scientists at a variety of companies, the author, David Giltner, explores why scientists choose careers in industry rather than academia. The book, is part of the “50 Interviews” series, so, if I’ve done my math correctly, we can expect another four books in the coming years. Beginning not later than 1 year after the date of enactment of this Act, each agency shall use plain writing in every covered document of the agency that the agency issues or substantially revises. Ocean Optics, an optical instruments company based in Florida, has started a program to fund small R&D projects related to optical sensing. The program is called “Blue Ocean,” and Ocean Optics has setit up like a privately-funded baby SBIR program. During Phase I researchers can apply for up to $10,000 for a six month project. Successful Phase I projects can then compete for a $100,000 Phase II research grant. This year’s deadline (June 30) has almost passed, but I’m really curious to see what develops and whether Ocean Optics tries it again next year. Photonics technologies underpin at least 10% of the European economy, and that reliance will increase as those technologies are further developed in the next decade. I would be really interested in hearing how the U.S. economy compares, because I’m guessing the percentage is even higher. Perhaps that might convince New York State to list optics and photonics (and not just “optical fibers”) as critical “emerging technologies” for the state, ‘cuz it’s kind of big here too. Yes! I think that’s interesting too. I wonder whether they merged sections, rearranged them, or just cut material out completely because nobody even remembered what it meant.